Worship is a way we connect with God and each other. We currently have three regular worship services at First Presbyterian: an informal service at 8:30, a traditional service at 10:30, and Jazz Vespers on the second Sunday of the month at 5:00 pm. From the ringing of the bells at the beginning until the postlude in at the end, our traditional service features the best elements of a traditional Presbyterian worship service. Our 25-member choir is backed by our 36-rank Schoenstein pipe organ, one of the finest in the Pacific Northwest. The service is also graced with special music, including frequent contributions by one of the three bell choirs associated with the church. The atmosphere is traditional but not somber, formal, but not stiff. Dress is casual, and everyone, including the people from the streets around the church are welcomed as we all worship God together. Grab a cup of coffee and take a seat the at the table in our fellowship hall. Our 8:30 informal service blends elements of traditional worship with creative ways of helping people interact with God. It features a lot of singing, a visual liturgy, and inspiring messages. Our Sunshine Singers lead the singing, while the pastor leads the flow of the service. We occasionally have bells and other instruments in the service. Afterwards the congregation gathers to pack bag lunches for the homeless. On the second Sunday of the month, at 5:00 pm we offer our Jazz Vespers which features local and national jazz musicians and artists who present their talents in the context of a very informal service. Readings come from poetry and the Bible, and there is a short inspirational message which is often tied to the music and the history of Jazz. The church has a group that changes the décor inside the church to match the seasons of the church and visually enhance the worship service. In church speak, this is referred to as “Liturgical Art.” If you have an interest in art in terms of texture, flow, and color you are invited to join the Liturgical Arts group in decorating the church to enhance the worship experience. Our art gallery, in the West Hallway, features new art every month by local artists. The artist does a feature in our monthly Jazz Vespers. All are welcome to join any of our choirs. We have 2 vocal choirs and 2 handbell choirs. 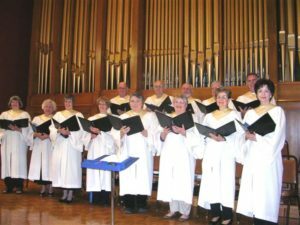 Chancel Choir—sing at the 10:30 am service each week excluding summers. The choir practices at 7 pm on Wednesdays. We generally have between 30 and 40 members in this choir. Sonshine Singers—sing at the 8:30 am service each week. The choir practices the third Monday of the month at 5:45 pm. We generally have between 8 and 12 people in this choir. Shepard Bells Handbell Choir—plays at either service on requested basis. They also are a part of the annual handbell concert held in December. This choir is designed for beginners through advanced handbell players. The choir practices Tuesdays at 5:30 pm. Tintinnabulation—This handbell choir is open to new players through audition and is designed for advanced players. To tryout for this choir contact the director of handbell choirs.